The All-Weather Pocket Notebook Kit includes a 3" x 5" pocket notebook with 50 sheets, an all-weather clicker pen, and a zippered Cordura protective cover. 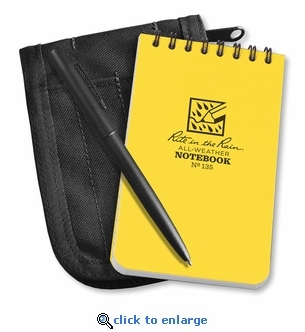 This notebook kit from Rite in the Rain is conveniently sized to carry with you in any emergency response situation. All-Weather Pocket Notebook (3" x 5") - Go-anywhere, anytime, in any weather notebooks. Universal pattern, these 100 page (50 sheet) notebooks are perfect for any situation. All-Weather Tactical Black Clicker Pen - These all-weather pens write on wet paper, any position and in extreme temperatures. Cordura Zippered Cover - These Cordura® Covers fit any 3" x 5" top spiral notebooks and hold up to 4 writing instruments.